We pursue your goals as though they are our goals. FAS is uniquely positioned to let you and your goals guide our actions. In 1979 Founding Director, Max Greer, designed FAS under the guiding principals of Expertise & Objectivity®. He, like the team today, wants your goals to drive the your experience and process in which FAS operates. Simply stated, you, the client, set the goal(s) and the team of professionals at FAS work to help you achieve them. We do not represent a specific investment company or sell a specific set of products. We do not accept referral fees or sales incentives from third parties. We do not recommend or sell proprietary investment vehicles. We will not make a recommendation which favors FAS interests over your best interests. 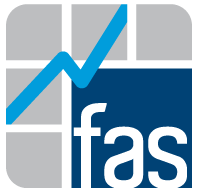 FAS is employee owned and firm revenues are derived from services performed for you. The fees charged for services vary by the type of service provided and scope of each project. Stand-alone financial planning engagements are quoted on a fixed-fee basis. Each plan project is unique and the scope and complexity will vary. Investment management services (which may include any needed retirement planning or current portfolio analysis) are based upon the size of the investment portfolio and are quoted on a fixed or tiered fee schedule. If you would like to learn more about FAS, feel free to contact us. We will set up an in-person initial meeting so you can ask questions and gain a better understanding of who we are and what we do. We will ask you to share your current situation, your goals and personal objectives. When you choose to engage FAS our team of professionals will develop a plan and recommendation. Each engagement is unique; should you require a financial plan there may be a modest charge for the work provided. If you choose FAS to manage your investment portfolio, you will sign an agreement with a clearly-stated fee for service. When you work with FAS you can expect full disclosure of all charges. There are no hidden fees or commissions paid to the team or advisor; only the agreed upon fee. This fee is established to align your goals with our compensation. Set the goal – set the path. Prior to any recommendation our team will conduct a series of meetings with you to gain a better understanding of your goals and financial objectives. From those meetings we will develop a custom plan and set a path to assist you in achieving those goals and financial objectives.